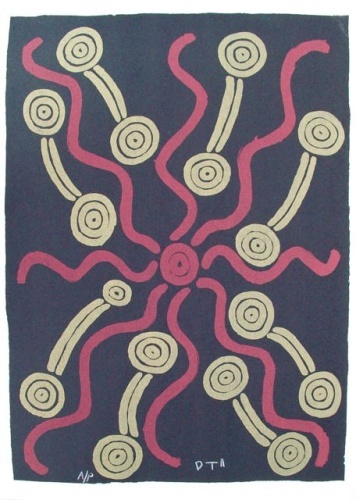 As a Western Desert artist painting in the Papunya area some 250 kilometres west of Alice Springs, Paddy Carroll works were mainly available through Papunya Tula Artsists Pty Ltd, a cooporative set up by the artists in 1971. Paddy Carroll lived and worked in the Papunya area and in Alice Springs, his works are in major collections throughout Australia. Paddy Carroll's mother's country is the site of Winparrku near Haasts Bluff. Paddy grew up in this area, the family coming in to Haasts Bluff and Yuendumu to collect rations of bread and tea. His father was shot by Europeans in the Coniston massacre of 1928. Paddy knows little of his father's country; his mother refused to speak of it after the murder. Two of Paddy's brothers also fled to Queensland. The three finally met up again when Paddy was a young man in his early twenties and they found themselves in the same army unit stationed in Elliott near Darwin during World War II. Jimmy KITSON, a leading ceremonial figure in the Willowra community, is also Paddy's brother. After the war, Paddy lived in Alice Springs and Darwin, working across the country as a carpenter and stockman. He worked for thirty years at Narwietooma station, droving cattle across the Tanami and helping to lay telegraph lines in remote areas. He began painting in about 1977 when John Kean was running Papunya Tula Artists and Paddy and his family were living at Three Mile Bore, an outstation of Papunya. David CORBY was probably influential in his starting to paint. Paddy's extensive ceremonial knowledge is indicated by the range of Dreaming stories depicted in his paintings. communities on a tour organised by poets Billy Marshall-Stoneking and Nigel Roberts. Paddy Carroll once remarked to a journalist puzzling over the meaning of a painting's iconography that 'We have had to learn your language, now it is time you learned ours.' Paddy and his second wife, Ruby Nangala, now live in their new house at Three Mile outstation, just north of Papunya. Painted the concentric circles included in the design of the Bicentennial $A10 note issued in 1988. He was one of five Papunya Tula artists invited to submit designs for the mosaic for the new Parliament House in Canberra. Berndt Museum of Anthropology, University of Western Australia. Parliament House Art Collection, Canberra. 1992 Tjukurrpa, Museum fur Volkerkunde, Basel. 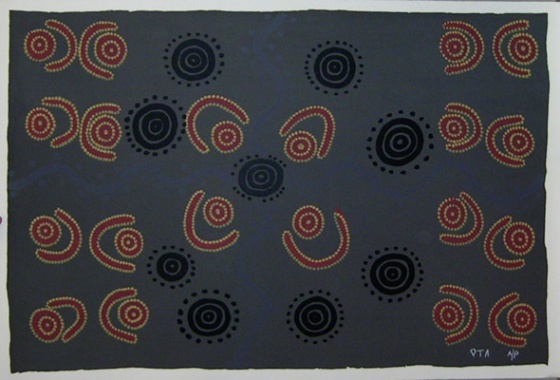 Isaacs, J., 1989, Australian Aboriginal Paintings, Weldon Publishing, New South Wales. Pacific, quarterly journal Vol 1 No 1 December. Australia, Centre for Aboriginal Artists, Alice Springs. exhib. cat., Heytesbury Holdings Ltd., Perth.